Due to time-varying atmospheric scatter and absorption we need to normalize our images. One of the biggest challenges in this work comes from the images being unfiltered so that we achieve the maximum signal-to-noise ratio in the shortest time, aiding our efforts to find very short flare events. We had achieved normalizations that were sufficient for most of our efforts by simply forcing the median stellar signal to remain constant frame-to-frame. This method is blind to stellar color but the atmospheric scattering certainly is not as evidenced by the blue sky. The histograms in the sections below this one were made with this older frame normalization method. One reason we have been using this normalization method is efficiency. We have, after all, made about one billion individual star brightness measurements over the past several years. As we began to explore ever more subtle effects, such as secular variation in pulsating stars, it became imperative to improve our photometry by incorporating stellar color in the normalization. In summer 2015 we worked to fit curves to plots of measured star signal divided by measured star signal in a reference image as a function of measured color index of the stars. A sample graph is shown here. The improvement was pretty stark. This work allowed us to move about 20 stars from "likely variable" to "variable." All of these stars were relatively low amplitude, short period pulsating stars, allowing us a much richer data set for the variable star population studies we are doing in our field. 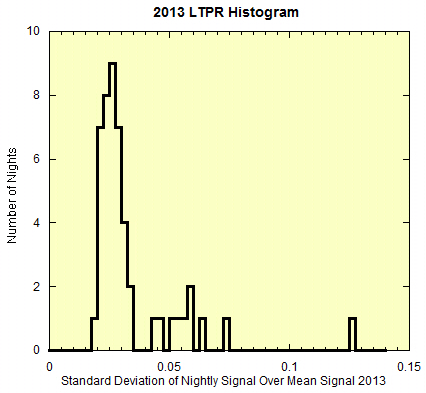 A measure night-to-night signal scatter in 2013. 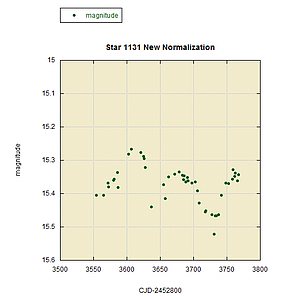 A histogram of night-to-night signal scatter in 2013 for the 800 brightest stars in the field with the known variable stars removed. 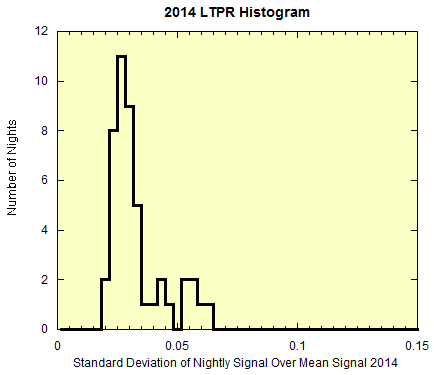 The statistic used in the histogram is the standard deviation of of the distribution of each star's nightly measured mean signal divided by the mean signal for the entire observing season. For most of our work we reject the outlying nights with relatively large values of this ratio. Above is the same histogram for the 2014 data. The distribution is similar to that seen in 2013, as we might expect. Note that the plot was scaled to match the prior year and one night was cut out, falling just to the right of the data shown above. Choosing where to make the cut to eliminate poor photometry nights in any year is essentially arbitrary. We have clear evidence that the poorest photometry nights lead to outlying points on our variable star light curves but exactly how bad and when an "outlier" becomes an "outlier" is (at least somewhat) open for interpretation. What is certain is that when we make a cut we need to keep every night below the cut and remove every night above the cut, no exceptions. Looking back I see that we chose 0.050 (5 percent) as the cut in 2013. With nothing to suggest strongly otherwise we used that same cut in 2014, eliminating 7 of the 47 data nights. We could have made an argument for using 0.035 and keeping only the "main peak" but we decided that we preferred to have those extra five nights in the data set. However, we remain aware that we need to be wary of making any big claims that rely heavily on those nights. 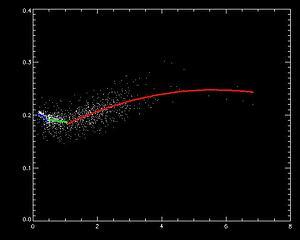 For example, see the blog entry about apparent flares in our semi-regular variable stars.